Fans of the trippy, menacing, and occult, take note of Slade House for this Halloween. It’s a haunted house story with a little something extra. Down a little side street near a pub, there’s an old house called Slade House. However, it’s not there all the time, not anymore. Just once every nine years or so, when the brother and sister who live there invite someone inside. And then never let them leave. I don’t want to give away too much of the intricate plot, but I will say that the story spans decades and tells the story of several of the “guests” of Slade House. It’s reality-bending and very creepy. And once you know what the stakes are, the constant uneasy and confusing atmosphere becomes threatening. Slade House is compelling, intricate, and has a great atmosphere of danger and confusion. If you like haunted house stories with a twist, give this a look! American history and haunted places are two of my favorite things! What a treat to find them both together in one book. If you want to understand a place, ignore the boastful monuments and landmarks, and go straight to the haunted houses…Tune out the patriotic speeches and sanctioned narratives, and listen instead for the bumps in the night. That is so true! The haunted places in a town or city are where you find the dirty secrets, the underbelly, the stuff nobody wants you to know about. Stories of ghosts are usually stories of some kind of trauma or betrayal or tragedy–and these stories also give these tragedies some meaning after the fact. There can be justice or understanding where there wasn’t any in life. A community can make sense of a terrible occurrence through weaving tales of hauntings. Ghostland is a tour of haunted places which never delves into whether ghosts are real or not. The fact that ghost stories endure is real enough, and that is what matters to Dickey. The focus is on what ghosts do for the living, what purposes they serve to individuals, communities, and cultures. The tour travels all across the United States, from houses to hotels to restaurants to prisons to graveyards to whole towns. Dickey is a wonderful tour guide. He’s informed and passionate and a great storyteller. The atmosphere he creates makes you feel that you’re traveling along with him. The book also addresses the fact that we live in a changed world. What do the ghosts of the digital age look like, of the information age? He mentions how digital lives on social media continue after death, and how that’s a kind of haunting. But in the end, we’ll always need ghosts, because we’ll always need a way to deal with death and mortality. The guises and trappings might change, but ghosts and haunted places will always be with us in one way or another, and they’ll always adapt to meet our needs. Only four days to go until the big day! Plenty of time for some ghostly armchair travel to get you in the mood. Claustrophobic and bizarre, and super creepy! Daniel Kehlmann’s You Should Have Left is a very tightly written and strange horror story. Our narrator is a screenwriter with a bad case of writer’s block. He’s spending a few days in a rented house in the mountains with this wife and daughter. He’s keeping a notebook of ideas and false starts for his screenplay. Soon, though, weird things start to happen. Strange shadows appear. Things he doesn’t remember writing end up in his notebook. And, as is traditional, the locals are very weird about the house he’s rented and look at him funny when he’s in town. The first-person format allows you to go crazy right along with our narrator. What is actually going on? Is this all actually happening? Is he truly going crazy? Or is he right, and the house is haunted? That isn’t quite right. It’s not the house that’s haunted. It’s the place. The very ground where the house is built is just one of those weird, off-kilter places where human beings don’t belong. That idea is a striking one, and kind of reminds me of those creepily weird stories about missing people and staircases in the woods on Reddit. Read this in one sitting in a quiet room to get the atmosphere and tension just right! A lovely, old-style ghost story, with echoes of Dickens and James. Perfect if you’re in the mood for a Halloween read with a classic feel. It’s old-fashioned and creepy, relying on a sense of foreboding to up the scares. Following the death of her father, Eliza Caine takes a governess position at Gaudlin Hall in Norfolk. Right away, the strangeness begins–there are no adults anywhere at the Hall, and the children have run through several governesses. Something is clearly very wrong. The more Eliza learns about the history of the house and its family, the more dangerous the situation becomes. Eliza must figure out how to stop whatever force is in the Hall before she and the children become victims. This story is very rooted in its time and place (London and Norfolk in 1867), so you might enjoy it as an historical novel as well. The atmosphere is rich, and it’s poignant and melancholy on top of being creepy–as the best ghost stories are. Every story in Every House is Haunted is like an eerie short film. There are haunted houses, sci-fi experiments, and psychic powers. What ties everything together is Rogers’ cinematic, absorbing style, and great ear for dialogue. You’re dropped into these little snapshots of surreal horror, which makes them all the weirder and memorable. It’s like watching The Twilight Zone. A cat goes to great lengths to be of service to his household. An odd sort of spider infests a house through the TV set. A haunted house is so dangerous it’s on a paranormal watch list. A group of explorers set forth into the gray boundary between life and death. A mysterious facility in the desert deals in ancient, dangerous boundary-breaking. A man inherits the old family house…along with its long-buried secrets. And that’s just a taste. There are twenty-two stories in this quirky collection. A lot of them would be perfect Halloween read-alouds. Surreal, entertaining, deftly told, this collection has a Halloween treat for everyone. Sometimes all you want to curl up with is a good old-fashioned haunted house story brimming with creepy imagery, unsettling atmosphere, and a main character who’s not quite all there. Audrey’s Door by Sarah Langan delivers. Audrey Lucas, an architect with a lot of baggage, is on the hunt for a place to live in New York. Apartment 14B in the historic Breviary building on the Upper West Side is available at an astonishingly low price. Even though she thinks it must be too good to be true, Audrey can’t pass up the opportunity to live for cheap in such a unique building–it’s the last standing example of the Chaotic Naturalism school of architecture. Never mind the fact that just recently a woman murdered all of her children in that same apartment, and then killed herself. And never mind the fact that Audrey immediately begins to have strange, vivid nightmares, and hears a voice telling her to build a door. Fans of The Shining and The Haunting of Hill House will find a lot to like in Audrey’s Door. In fact, Langan gives those works and a few others their due in a note at the beginning of the book. Gloomy corridors, a protagonist on a downward spiral that’s seemingly impossible to stop, a building with a mind of its own, and when the terrifying insanity ramps up, it ramps up. Like the Overlook Hotel and Hill House, the Breviary is a character, complete with motivations and personality. It’s such a strong entity that it can’t help but overcome any human beings who come into contact with it. Langan takes the time and care to give the Breviary’s backstory just as much attention as she does Audrey’s, which works to build the connection between the building and its chosen favorite. That’s what separates the good haunted house stories from the so-so ones–the good ones make sure the house has a personality and a history, a reason for being the way that it is. A haunted house doesn’t just have ghosts or ghoulies in it. A haunted house has an energy, a force, one that turns our cozy idea of hearth and home on its head. That’s why they’re scary, after all. You’re supposed to feel safe in your home. When your home is insane, there’s nowhere to hide. As much as Langan might owe to haunted house classics, she has a style all her own. She has a great talent for writing compelling protagonists and for truly disturbing and creepy imagery. Her writing is very character-driven, and everyone has a strong voice and personality. Audrey’s descent into madness is a chilling one to witness. Langan is also darkly funny at times, too, which always makes a welcome counterpoint to the scary. There are also some very well-placed New York City references and nods, which add a nice sense of place. If you’re after a cozy, old-fashioned spook house book for Halloween this year, Audrey’s Door might be a good one to try. And what lies behind the 17th Door? Your greatest fears – and one of the most anticipated haunted experiences of the Halloween season in Southern California. Southern Californians Robbie and Heather Luther are the masterminds behind The 17th Door. Neither have any horror background, but they had a dream of creating an immersive haunted house experience after visits to several haunted mazes. Their intent, as quoted in the LA Times, is to disturb, terrify, and occasionally offend visitors. Judging by the articles I’ve read, they’re succeeding. Set at a medical college, the 17th Door’s well-developed backstory follows a troubled student named Paula who battles a host of demons ranging from drug abuse and an eating disorder to bullying and suicide. Paula’s personal demons show up as physical manifestations in the college’s classrooms, dormitories, cafeteria, library and locker room. Sometimes Paula is in the room with you and other times you view the scene from Paula’s point of view. The 30-minute experience unfolds in 17 locked rooms that rival movie sets for their intense attention to detail. Visitors will be pulsed through in small groups of approximately eight people and spend about 90 seconds in each room. And there’s a good chance you will get wet – either from a putrid toilet or by a monster’s tongue. Ew. Too spooky for me. I’d rather sit at home and read haunted house stories. I like my thrills and chills at a safe remove and without any tongues. 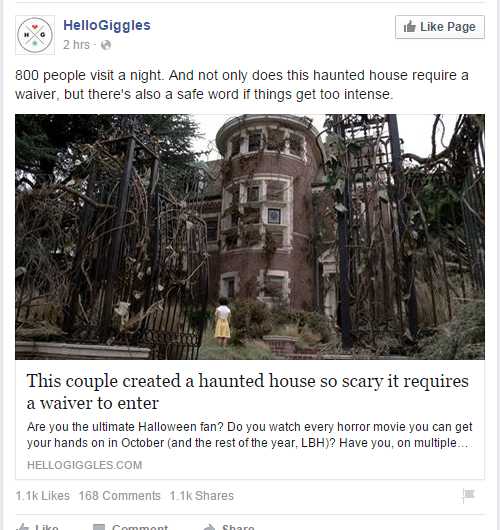 If you feel the same way, here’s a post from a couple Halloweens ago which talks about ghosts and haunted house stories. You could also check out my posts about The Unseen by Alexandra Sokoloff, Rooms by Lauren Oliver, and The House of Small Shadows by Adam Nevill. I’ve also just finished a wonderful haunted house story by Sarah Langan, called Audrey’s Door. I hope to have a post up about it this week! The rest of you braver souls can have a look at the website for The 17th Door. Find it here. You don’t need to sign anything, but brace yourself for creepy imagery.